We offer all our clients a series of guarantees that mean you can expect excellent care and excellent value at every visit. 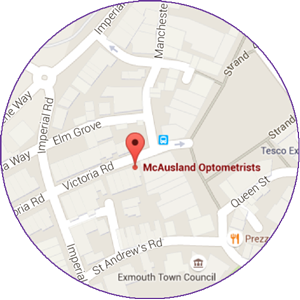 Your spectacles will always be dispensed and fitted by a qualified professional. We only employ fully-qualified, experienced staff – meaning you will always get sound advice about which lenses are best suited to your personal requirements, and your frames will always be chosen with the required lenses in mind, rather than style alone. We know that your glasses may see a bit of rough and tumble from time to time… Should your spectacles require any adjustments during their lifetime, we promise to tighten them, straighten them (and clean them!) as often as required – at no charge. We are confident that our spectacles are not only good quality but also represent good value for money. We regularly check our prices to ensure we remain competitive, but in the unlikely event that you find the same pair of glasses elsewhere at a lower complete price, we promise to refund the difference – while maintaining the comprehensive aftercare service you have grown to expect from us. To honour the guarantee we will require a written quote for an exact like-for-like specification, from any GOC registered practice within a 10 mile radius. If for any reason you are unhappy with the vision in your new Varilux spectacles, we will swap them out for a more appropriate alternative and credit any difference in price to your account for use against future purchases. All we ask is that you allow us the opportunity to ensure correct fitting and take our advice if we ask you to give your eyes a little longer to adapt – especially if they are a new type of correction. We promise to never leave you stuck with an unsuitable pair of spectacles, so should you ever have difficulty with a new pair of glasses always feel free to drop in so we can try to solve the problem – there will generally be no charge. In addition to our Guarantees, in 2018 we became one of the first practices in the country to achieve Eye Promise accreditation.